Christina Marie and C.J. Malloy in Maple and Vine. Photo by Conrado Johns. BOTTOM LINE: Performed in American Sign Language and English, this bone-chilling and occasionally funny play suggests that one might need a little oppression to be happy. Katha (Christina Marie) and Ryu (C.J.Malloy), a young married couple, are trying to overcome a miscarriage. The isolated life of career-oriented Manhattanites drives Katha further into depression. A glimpse of hope and of a new, meaningful way of life presents itself through a chance encounter with Dean (Christopher Corrigan). Dean and his wife Ellen (Liarra Michelle) are prominent members of SDO (Society of Dynamic Obsolence), a community of re-enactors living in a never-ending 1955. Hooked by the promise of a simple life where overcoming obstacles pushes families closer together, Katha convinces Ryu to trade their jobs as a publisher and a plastic surgeon for a traditional suburban house in the "1950s." Katha, turned Kathy, enthusiastically learns how to cook, while Ryu, as a person of Japanese decent, has to start at the bottom of the professional ladder, namely folding boxes at a box factory. Racism, sexism, and homophobia are carefully recreated as distinctive signs of the times. To be period appropriate, California-born and raised Ryu claims that he is from Japan and used to do ikebana back home. Kathy encourages the fellow citizens to give her dirty looks at the supermarket and bang on garbage cans at night “to make everybody’s experience more authentic.” The constantly shifting border between the 1950s and 2010s demands the characters to decide who they are at every minute, keeping the tension high through the nearly three-hour show. Maple & Vine is hilarious and uncanny in inventing forms of oppression, which the characters engage in willingly, even enthusiastically. Kathy suddenly flourishes in the environment of mental sadomasochism and eventually gets everything she longed for in “real life.” Eager to become a true-to-life “actress” at first, Kathy eventually takes upon herself responsibilities of the “narrator” in a masterfully performed scene with Ellen towards the end of the play. No publishing career can compare to the position of master puppeteer in the SDO community, a place where real people live out the fiction she creates. The sound design by Adam Salberg features mostly room tones or ambient noises of various locations, aiding the minimalistic scenic design by Jennifer Varbalow and video projections by Gregory Casparian. And as this is produced by New York Deaf Theatre, Maple & Vine is performed mostly in American Sign Language with some use of (spoken) English. Director Jules Dameron uses English not just as a convenience for the hearing audience, but as a deliberate artistic choice. We hear Ellen speak during the info-sessions about SDO, but these are never her own words—she either translates what her husband signs or signs to a recording. When Kathy dreams about her former coworkers Omar (Dickie Hearts) and Jenna (Liarra Michelle), Ryu narrates it from his bed. The spoken voice is nearly always dis-attached from the speaker, much like the characters are dis-attached from themselves. 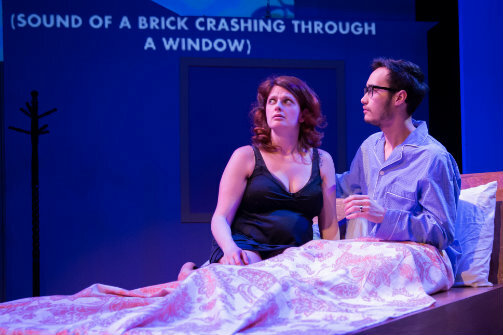 This ASL production of Maple & Vine not only makes the play accessible for a broader range of audiences, but also creates additional layers of meaning by using different languages. It is not merely a translation, but a successful experiment in building an intricate Rubik’s cube, which I keep spinning in my head many days after the show. Maple & Vine is by Jordan Harrison. Directed by Jules Dameron. Produced by New York Deaf Theatre. Lighting Design by Annie Wiegand. Projections Design by Gregory Casparian. Scenic Design by Jennifer Varbalow. Costume Design by Lisa Renee Jordan. Props Design by Kate Testa. Sound Design by Adam Salberg. Production Manager is Will Jennings. Production Stage Manager is Miriam Rochford. The cast is Christina Marie, Christopher Corrigan, Dickie Hearts, C.J. Malloy, and Liarra Michelle.